This is my favorite post here yet!. 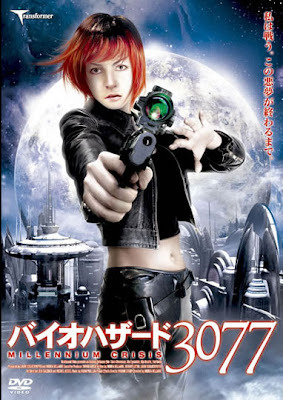 According to the Transformer website, this seems to be the Japanese cover for our feature Millennium Crisis. "The aurora which has the special ability “one time you just saw to be able to become the other race”, was the end 裔 of race “blood mask” of legend." That actually seems like a reasonable summation of the story. Someone must have watched the movie in Japan. I really love this cover a lot. Sure, in the actual movie that gun, those pants, this whole scene even, doesn't actually happen. But who cares?! And truthfully, I like the name "Biohazard 3077" the best of all the names this movie's had so far. At some point we should actually have a copy of this version of the movie. I can't wait to see it in Japanese! Awesome, awesome, awesome! And BIOHAZARD 3077 is a pretty groovy title, indeed.